Matchbox's "NASA S.E.V. / Chariot," seen on blister card, replicates the space agency's planetary rover concept. A NASA concept vehicle for exploring the sweeping terrains of planets and their moons can now rove around a much smaller, more personal surface: the palm of your hand. The "NASA S.E.V. / Chariot," as it is labeled on its package, is the fifth toy car out of 20 in Matchbox's current "Off Road" assortment (and number 90 out of 125 in the 2018 overall assortment) now being sold in stores. The SEV's blister card (or box, depending on where you find it for sale) features an illustration of the Space Exploration Vehicle traversing a terrestrial desert scene. Engineers, geologists and astronauts tested the surface version of the Space Exploration Vehicle in Arizona in 2008. Derived from a 12-wheeled chassis developed in 2007 and a Lunar Electric Rover (LER) concept that debuted in 2008, NASA's SEV was designed to accommodate multiple types of astronaut-led missions, including exploring locations across both the moon and Mars. To that end, unlike the Apollo-era lunar rover, the SEV can be equipped with a pressurized cabin that serves as both a control cockpit and living quarters for the crew. The SEV cabin also features a "suitport" at its rear that enables astronauts to don and doff their spacesuits without needing a separate airlock. The suitport makes it quicker and easier for the crew to venture out on multiple, short-duration outings to investigate the surrounding area. NASA test drove the SEV in a rock yard at Johnson Space Center in Houston and took it on several analog missions, called Desert RATS (Research and Technology Studies), between 2008 and 2011. Follow-on variants, including the Multi-Mission Space Exploration Vehicle (MMSEV) and an Alternate MMSEV that could serve as a lunar lander cabin, were advanced through 2013. The SEV has also made several high-profile public appearances. In 2009, the SEV (then known as the LER) was driven down Pennsylvania Avenue in Washington, DC as part of NASA participation in the Inaugural Parade honoring President Barack Obama. In 2015, the vehicle was featured in the large-format film "Journey to Space 3D," which was narrated by actor Patrick Stewart. 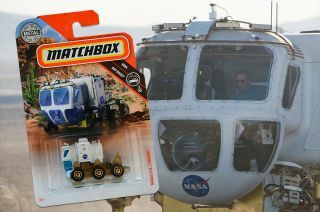 Matchbox's "NASA S.E.V./Chariot" toy model. And in 2017, NASA drove the SEV into downtown Houston for the public festivities surrounding Super Bowl LI (51). The Matchbox version of the SEV packs a lot detail into a small model. Although the toy reduces the number of tires mounted on the Chariot from twelve to six, the die-cast metal cabin includes the raised outline of the two rear suitports, as well as the side-mounted docking hatch where the real SEV could attach to a habitat or another rover to facilitate the transfer of its astronaut crew. The toy's cabin also features miniature versions of the real SEV's forward-facing windows, including the bubble protrusion from the center lower pane that offers a better view of the planet's surface. Looking into the toy's windows reveals its two seats inside. The scale model also sports the NASA logo on both of its sides, which is noted on the packaging as "with permission" of the space agency. The NASA S.E.V. / Chariot is the first Matchbox car to be modeled after a NASA road vehicle in decades. Earlier toys in the line have included a rocket transporter and a "Space Shuttle Command Center" tracking van from the early 1980s. In addition to the SEV, Matchbox has said it plans to release a toy model of Sierra Nevada Corporation's Dream Chaser commercial spacecraft later this year as part of its Sky Busters aviation-theme line. See more photos of the Matchbox NASA S.E.V./Chariot toy model of NASA's Space Exploration Vehicle at collectSPACE.